Hier können Sie Zauberer Zettelwitz bestellen! 2019: On popular demand I am preparing another edition of this book. A delight for children and bird lovers alike and anybody else! Because I love watching birds, I made Zettelwitz into a bird watcher, too. This childish wizard (and cruel as children can be) develops into a decent man, because he loves Ronja and finds to his astonishment that he feels much better being liked for his useful craft, than hated for his cruel jokes. 3 books in one: 1.German (or Afrikaans); 2. 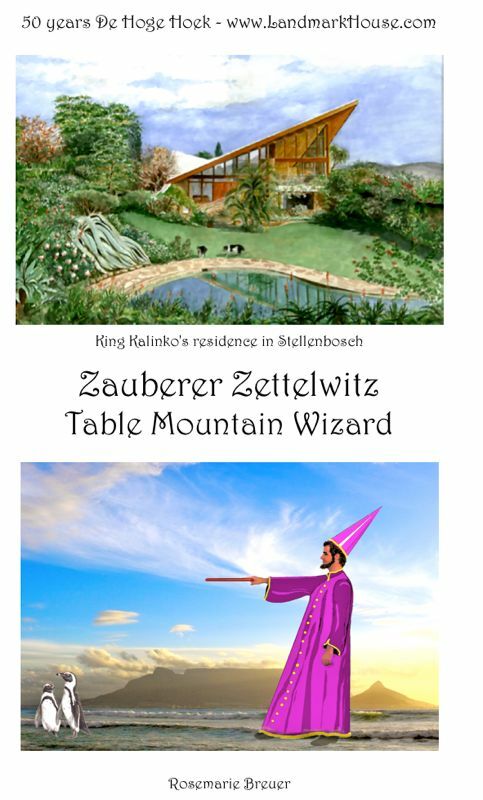 English and 3. a first bird book introducing birds of the Western Cape. These are special editions of outstanding quality print. Numbered and signed by the author. 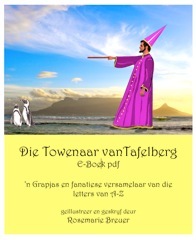 Softcover, excellent quality, 60 pages - Price R 280 or Euro 18. 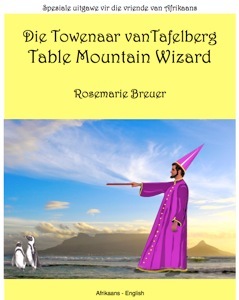 These special editions can be ordered with your own heading (Example: "For the friends of Table Mountain") and logo at a special price. 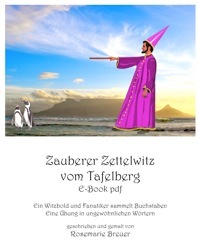 I have read Zettelwitz with interest and enjoyment - the concept is original, and it is executed wittily and inventively. I should think that children would find it both entertaining and instructive. A new unique, imaginative and educational children's book. It has been written with a play on words, and provides a page for every letter of the alphabet. I found the text charming and original - well done! I read your book last night - so imaginative, fanciful, original, artisitic AND instructive! You are very clever! CONGRATULATIONS! Your book is absolutely brilliant! I can't wait to have children and will save it for them! Fantastic that you are also doing American and European versions. - amuse yourself and your children, too? - teach them the letters, counting, an interesting vocabulary or rhymes? - get an introduction to the birds of the Cape? 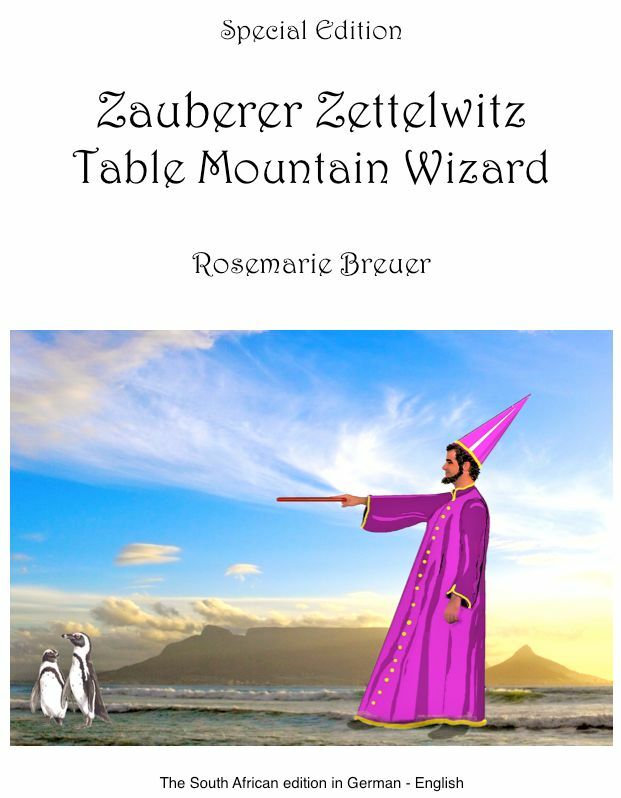 Zettelwitz the Wizard is a prankster and a fanatical collector of all sorts of things. This time he decides to transform creatures and objects into their capital letters to obtain the whole alphabet. Magic rules require that his prey somehow resemble the letter. He doesn't get away with it very easily, some of his victims put up a fight. They chase him and catch him, but he manages to escape more than once. Zettelwitz is in love with beautiful Ronja. When he experiences her wrath, he decides to change his ways and impress her with some useful magic. It felt good to be admired. In fact, it felt much better than to be feared and hated. Children will enjoy the rhymes and play on words as much as their parents do. You are doing your children a favour by reading them texts, which include some unusual vocabulary. The book is accompanied by a glossary. Möchten Sie sich amüsieren und ihre Kinder auch? Ihnen vielleicht sogar etwas beibringen: zum Beispiel die Buchstaben, einen großen Wortschatz und Reime? Wollen Sie in die Vogelwelt vom Kap eingeführt werden? Oder möchten Sie Ihre Sprachen üben? Zauberer Zettelwitz verwandelt geeignete Dinge und Lebewesen in ihren Anfangsbuchstaben, um das ganze Alphabet zu bekommen. Die müssen allerdings etwas dem Buchstaben ähneln, das erfordern die magischen Regeln. Niemand lässt sich das gern gefallen und er muss viel Hinterlist anwenden um sein Ziel zu erreichen. Er wird gejagt, verhauen, gefangen und entkommt mehrmals. Auch ist er verliebt - er will seiner Ronja gefallen und stellt dabei fest, dass es noch mehr Spaß macht, etwas Nützliches zu zaubern. Es ist doch schöner, angesehen zu sein als gehasst zu werden. Sie tun Ihrem Kind einen Gefallen, wenn Sie ihm Geschichten mit großem Wortschatz vorlesen! Zettelwitz die Towenaar is 'n grapjas en 'n fanatiese versamelaar van allerhande dinge. Hierdie keer besluit hy om diere en voorwerpe te verander in die hoofletters van hulle name en om so die hele alfabet bymekaar te maak. 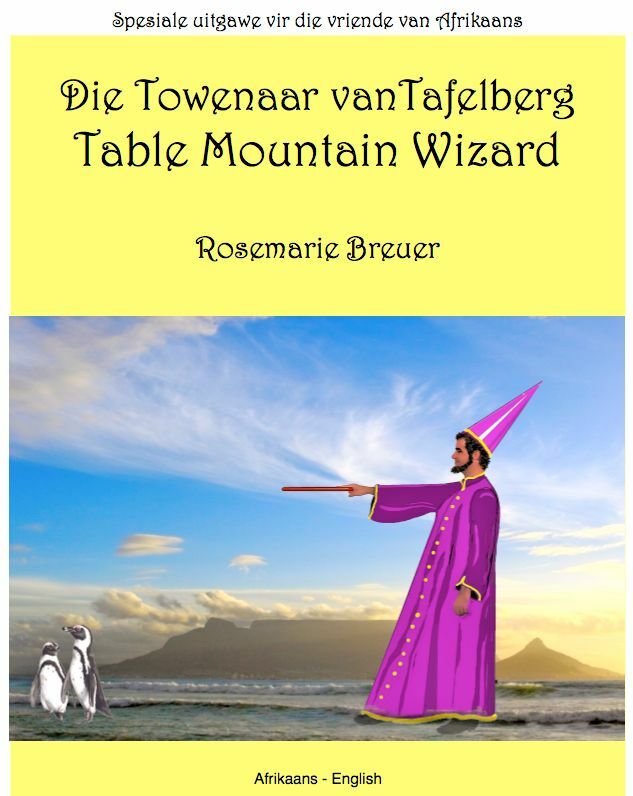 Die towerreëls sê dat sy prooi op die een of ander manier soos die letter moet lyk waarin dit verander moet word. Hy kom nie maklik daarmee weg nie en party van sy slagoffers baklei kwaai terug. Hulle jaag hom en vang hom, maar hy kry dit meer as een keer reg om te ontsnap. Zettelwitz is verlief op die beeldskone Ronja, maar wanneer sy kwaad word vir hom, besluit hy om 'n nuwe blaadjie om te slaan en om haar te probeer beïndruk met sy handige toorwerk.